Leverage SD-WAN to deliver agility and flexibility, and reduce costs with a positive ROI as your enterprise encompasses digital transformation. Digital transformation means change -- change in IT, networks, business operations, and business models. This means that you need agile, flexible business continuity solutions for your networks. Organizations undergoing digital transformation projects have goals to remain competitive or increase the competitiveness of an organization. Networks need to be more flexible, more responsive to change, and deliver the performance required quickly. Traditionally, all network traffic has been treated equally. With the advent of MPLS and QoS, priority traffic transfer can be delivered. This is accomplished by tagging traffic for priority treatment. It's become apparent that traffic delivery priority should be based on the application communicating and delivered in real time. Enterprises have adopted MPLS. They have to look at the cost. The Internet is a less expensive alternative but does not always deliver the desired performance. What if we could combine the two worlds together and make traffic forwarding decisions based on real-time network conditions? Software-defined WAN (SD-WAN) is a candidate to deliver this capability. SD-WAN addresses a shift in application and WAN traffic profiles and delivers a better cost-benefit solution. SD-WANs can help overcome the challenges for digital transformation in a manageable way for the enterprise. The concept is to have at least two or more WAN connections (hybrid WAN) for each branch office. This means leveraging two or more different network connections such as MPLS, broadband, or wireless. You have Internet and MPLS connections. You can use the Internet as an alternative or in conjunction with MPLS. You can connect to multiple providers. This allows you to switch providers, mix and match providers, or replace MPLS connections with broadband. This flexibility can stimulate providers to ensure service delivery better than their SLAs. Changes in branch office connections and capacity can be implemented much faster, possibly in minutes, not days or weeks. Network performance can be improved and bottleneck issues rapidly resolved. SD-WAN offers greater network visibility and control. It provides access to private line performance when needed. It reduces overall operating costs. 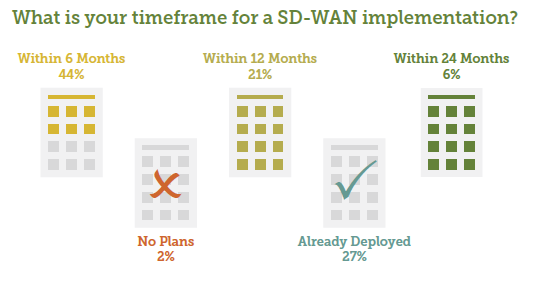 You cannot avoid considering an SD-WAN implementation. The question is when you will migrate to SD-WAN. The graphic below displays the responses to the survey conducted by Silver Peak and IDG. On-premises solution -- In this solution, you have no cloud-based applications, but you have an SD-WAN router on premises. You are probably using MPLS for real-time applications and the Internet for everything else. It offers lower cost, load balancing, traffic shaping, and can help you with business continuity. Cloud-enabled solution -- You still have an SD-WAN router that acts as a gateway to the cloud. You get the benefits of the on-premises architecture plus increased performance and reliability for your cloud applications. This works best when you are connecting to a number of major cloud applications. The benefits include improved performance, reliability, traffic shaping, and business continuity. Cloud-enabled solution with a backbone -- You have the on-premises SD-WAN router connecting to the SD-WAN provider's nearest network point of presence. Your traffic traverses the provider's WAN, acting as a private network backbone. This improves real-time traffic performance such as voice, video, and virtual desktop operations. This is most attractive to enterprises that want to eliminate MPLS network costs and do not want to have problems with 100% of the traffic going over the Internet. The primary benefits here are traffic goes over the private backbone, improving performance, reliability, load-balancing, traffic shaping, and business continuity. All of this means that you can deliver the agility and flexibility while reducing costs with a positive ROI as the enterprise encompasses digital transformation. "The Time Is Now for Digital Transformation"
"Digital Transformation: Who's in Charge?" "Into the Future with Chief Digital Officers"